Laurence Mussio examines how federal and provincial public policy tried to keep pace with the diffusion of telecommunications, consumer demand, and a rising tide of technological innovation. Telecommunications regulation struggled to maintain a balance between producer and consumer in an increasingly complex field and policy makers were compelled to defend the national interest in international telecommunications arrangements or by making far-reaching decisions about transcontinental microwave systems and satellites. By the late 1960s national policy makers had embraced the arrival of the computer - especially once it began to be wired into Canada's communications infrastructure. Telecom Nation explores the impact of the computer on government policy and the first attempts to build a "national computer utility" - the beginnings of the Internet - twenty-five years before it became a reality. 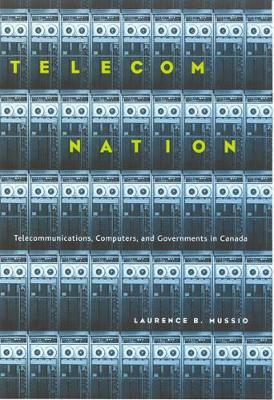 Based primarily on the rich and largely untapped sources at the National Archives of Canada, Cabinet records, provincial archives, and private sector repositories, Telecom Nation provides an essential background to contemporary public policy issues by examining how governments reconciled technological change, private enterprise, consumer demand, and the public good in communications. It will be required reading for students and specialists interested in telecommunications, public policy, and technological change.